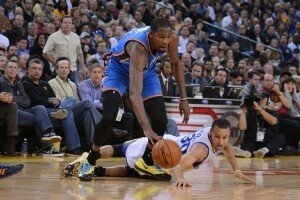 You are here: Home / Blog / The Scraps / Remember When Kevin Durant Thought Stephen Curry Was White? August 21, 2014 By Nick A. When players make it to the NBA, many of the times, this isn’t the first time these players have seen each other. I’m not saying that they meet for the first time in college or pre-draft workouts. I’m talking about going way back. Like, elementary school back. Well, Durant wasn’t shy about answering the question and had everyone gasping for air when he told everyone what he thought when he first saw Curry. You gotta admit, it was pretty funny. I guess that’s why they called the show NBA2k Uncensored. Check out the interview first hand for yourself.